S winds work best but the slope works ok with SSE to SSW winds. When offshore winds are blowing W to NW, Bluff Park is in the vortex from the Palos Verdes Peninsula and the winds will often be favorable at the slope. Los Angeles Pier J (MesoWest), Pier J = 2.5 mi. SW of slope. 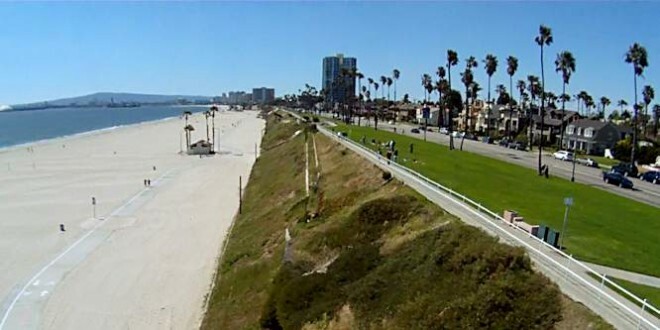 CW0181 Seal Beach (MesoWest), Belmont Heights, 2.5 mi. ESE of slope. Long Beach Airport, (MesoWest), 4 miles N of slope, inland behind Signal Hill. 40′ slope with a large mowed lawn on top and a broad expanse of sandy beach below for LZs. Slope recovery is easy however City Ordinance prohibits climbing slope. Police advise us to recover from the bottom up, not top down and there is a stairway to bottom near slope. Moderate rotor on top. No DS potential. Go S. on I-710 to Broadway exit and turn LEFT. Go E. on Broadway for 2.8 mi to Paloma Ave. and turn RIGHT. Go S. on Paloma 0.2 mi. to Ocean Blvd. and turn LEFT. Park Car! Go W on 2nd Ave. for 1.8 mi to Livingston Dr. and turn LEFT. Continue E on Livingston Dr. (Livingston Dr. becomes Ocean Blvd.) for 0.6 mi. to Redondo Ave. Park Car! Park anywhere on Ocean Blvd. between Orizaba Ave. and Redondo Ave. Flying site is opposite Coronado Ave near wind sock pole. 33.76101, -118.15358 – E. end of Bluff Park.